The goal is to create a new cultural sightseeing experience for tourists by joining hands with the three national performing arts centers in northern, central and southern Taiwan. Culture is the most unique representation of a country or city. Theaters, concrete and subtle, show the face of local culture and theater architecture, and are also the landmark and cultural landscape of the city they are located in. Walking into the theater, from the appreciation of architectural style to the performance of the show, tourists can see the cultural style of Taiwan and the lifestyle of the local community. The National Performing Arts Center has a national-level theater in north, central and southern Taiwan. They are respectively, the National Theater and Concert Hall in Taipei, the National Taichung Theater in Taichung City, and Weiwuying National Kaohsiung Center for the Arts, which recently opened on October 13, 2018 in Kaohsiung City. These three national arts and cultural centers are important channels for international travelers to experience local characteristics and Taiwanese culture. In recent years, the desire for people to have cultural experiences has created a new boom in the global tourism market. 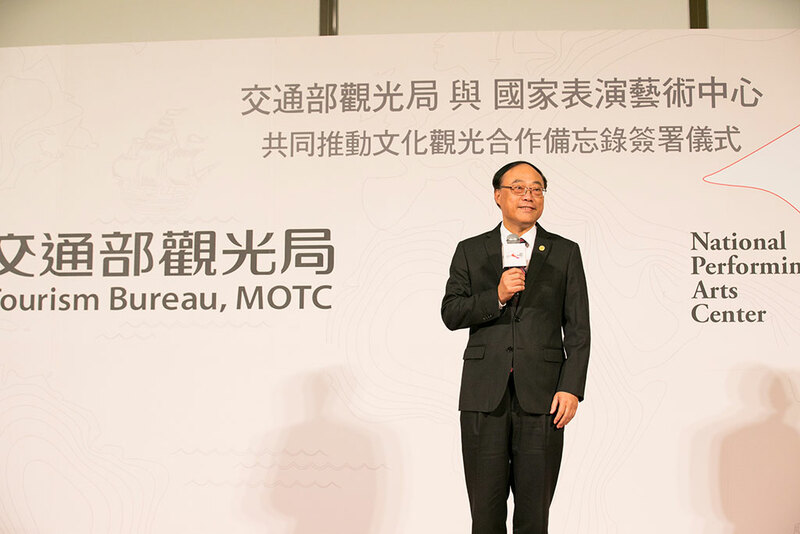 To enable the Tourism Bureau (MOTC) to provide more in-depth travel content and more profound Taiwanese experiences for international travelers, the Bureau’s Director-General Joe Y. Chou is putting efforts into stimulating cultural tourism, while at the same time promoting tourism competitiveness and sustainability. And for many years, Ju Tzong-ching, chairperson of the National Performing Arts Center, has advocated that culture should be used for tourism, education, and the economy, and to create a new spotlight in Taiwan based on the theaters. This cooperation between the two sides will be based on the three national theaters and will serve as a pilot for creating a new model of cultural tourism cooperation. Today (Nov. 9) we are officially launching the "Cooperation to Promote Tourism through Cultural Axis." It’s the intention of the two sides in signing a Memorandum of Cooperation on jointly promoting cultural tourism. Today's cooperation is not only a pioneering initiative, but also a new opportunity for cooperation between the two ministries. 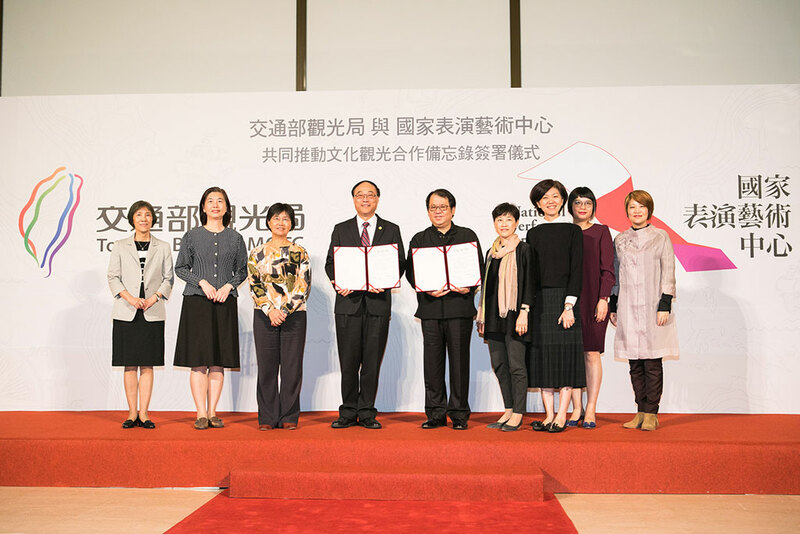 Through this cooperation, we hope to truly implement President Tsai’s vision of "using cultural thinking for government administration," and integrating culture with tourism, to opening up new developments for Taiwan tourism. 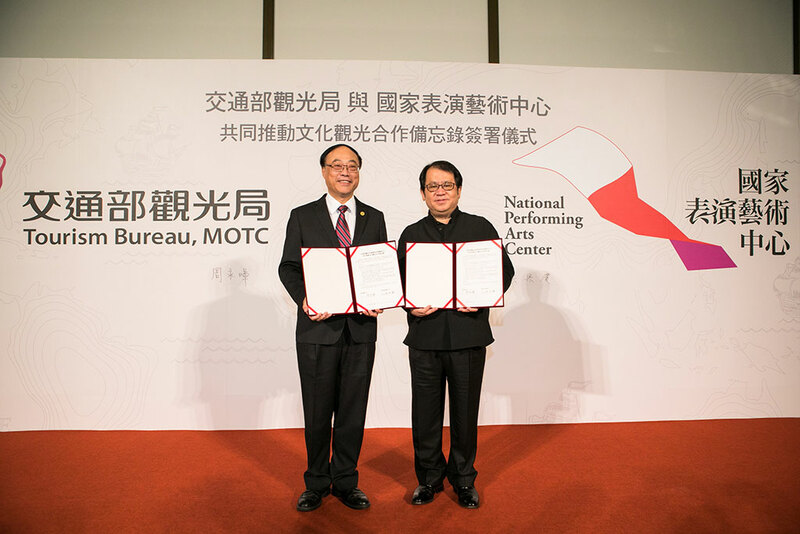 The Memorandum of Cultural Tourism Cooperation signed by the Tourism Bureau of the Ministry of Transportation and Communications and the National Performing Arts Center covers four aspects: publicity, promotion, marketing and training. In the future, the brand image of Taiwan tourism and the National Performing Arts Center will be exposed to strengthen publicity and explore a diverse model for cooperation to allow visitors to enter the theater, enjoy life, admire the architecture and watch performances. The two sides will also jointly recommend the literary and artistic travel itinerary to encourage domestic and foreign travelers to get close to the arts and culture. For international travelers, we will strengthen our cooperation to promote marketing by connecting transportation tickets and travel accommodation, ticket discounts and Taiwanese culture. In addition, through the exquisite quality and innovative service models of the three venues, they will stimulate each other to enhance the artistic and cultural literacy of tour guides and enhance the training them. 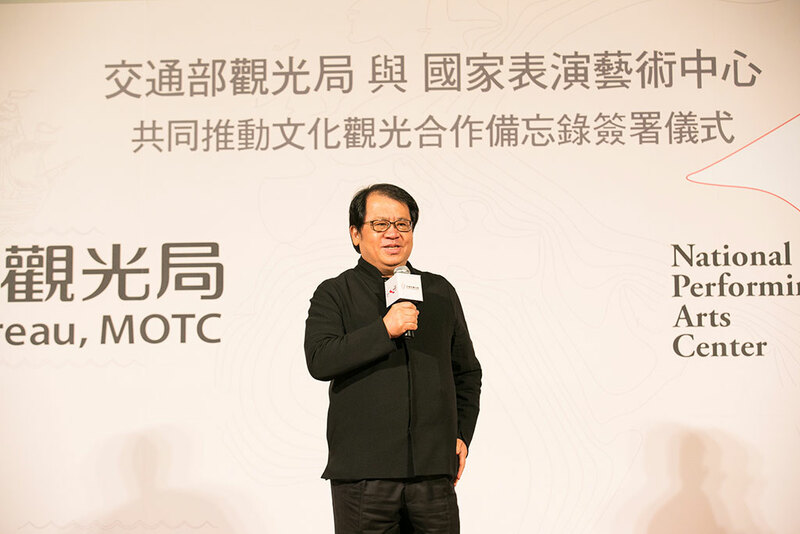 Director Joe Y. Chou of the Tourism Bureau (MOTC) said that the alliance with the National Performing Arts Center is the beginning of the dialogue between art and tourism. In the future, the Bureau will cooperate with various cultural and art fields to present different characteristics of Taiwan, integrate local culture and arts and serve as a bridge to recommend arts and culture-rich itineraries for international travelers. This will hopefully spread the beauty of Taiwan through the platform of tourism and encourage international travelers to come to Taiwan to experience the beauty of life and culture. In addition, Chairman Ju Tzong-ching of the National Performing Arts Center, said: Taiwan's performing arts are diverse, rich and full of creativity. At any time, as long as you have time, you can find a good show in the theater, or a concert worth listening to. When the show ends, you don't have to rush to leave, you can find a coffee shop nearby, and share your feelings with friends and family. If the weather is good, if you don't want to stay at home, there will be performances suitable for the whole family in the outdoor area of the theater. We warmly welcome domestic and foreign tourists to visit the three theaters in the northern, central and southern Taiwan venues of the National Performing Arts Center!